She said squawk yes! Our very own @AMSlimfordy is engaged. Join me in wishing him and his bride to be the best of luck as they build a new nest, together. Also, a big thanks to E-Star for the awesome celebratory image above. 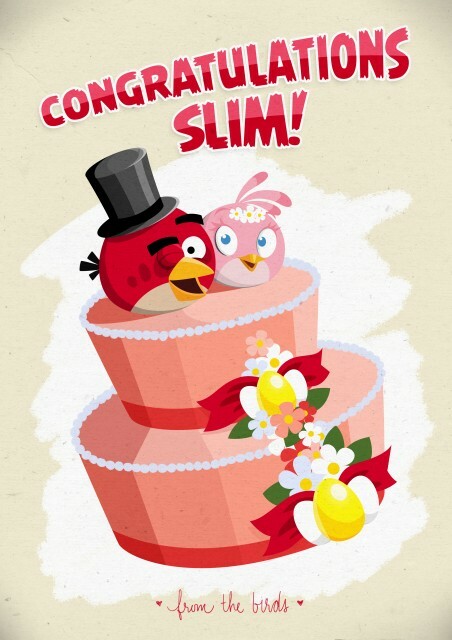 Update: Now Rovio has joined the celebration and created the awesome image below just for Slim. @AMSlimfordy and the soon to be misses AMSlimfordy CONGRATULATIONS!!! I assume we are all invited yes? So where do I have to book my next vacation to? @AMSlimfordy -- Oh WOW! Congrats! Best wishes for a life filled with joy and happiness. Be sure you show her this page, I'm sure it will soon be filled with good wishes. Did this happen on the cruise? When is the wedding? Is she ready for an AB-themed wedding? You don't need to answer -- I'll understand, but I'm just excited for you both and brimming with curiosity. I think you better plan a virtual wedding on Peacock Island. Where else could you fit a couple thousand friends? The Love Boat worked! Congratulations. Nothing more romantic than being at sea. Whoo Hooo a Huge Congrats to @AMslimfordy and your soon to be Mrs's!!! May your life be filled with lots of Love, Joy and more Happiness than you can stand!! Wonderful news, just Wonderful!!! And how romantic to do it on the high seas!!! Kudos to you Slim for making it an even bigger event for her to remember with joy!!! Congratulations @AMslimfordy to you & your bride-to-be! I wish you much joy, love & happy days together! Congratulations! Wishing you lots of love and laughter. Congratulations @AMslimfordy! Best wishes to you and your fiance! 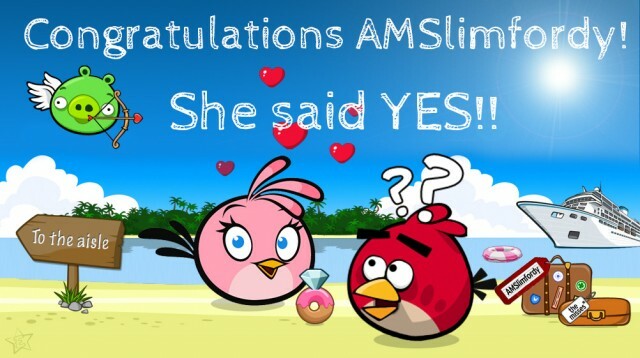 Congrats, teach her how to play Angry Birds as well! congrats, you wont even remember what life was like before this and honestly what's ahead is going to be so amazing you're not going to want to. @amslimfordy Congrats! Enjoy! Understand. Love. Share. Always. Little-known fact: The Misses started playing Angry Birds before I did. She introduced me to AB during the Season's Greedings Advent calendar. As soon as I got my iPhone a few months later, I started playing, and the rest is history! OMG it is indeed a match made in heaven!!! @AMslimfordy give the bride our heartfelt thanks for sucking you into the AB world!!! Can't imagine this site without you!!! Congrats, Slim!!! Thanks future-Mrs. Slimfordy for introducing Slim to AB and nice job, E-star!!! Congrats, Slim! Best wishes to the both of you! Heartiest Congratulations to Both of u.
have a love and happiness! Congratulations Slim. Now, if you'll practice this phrase, I predict a long and fruitful marriage. "You're right dear". Congratulations on your engagement! Wish you both the most happiness that marriage brings for two individuals. Being with someone you love is one of the greatest joys this life brings to us humans. Enjoy each moment, the good ones and the others, because they all are part of the "adventure" of being with someone that means more to you than anything else on this earth. @AMslimfordy gongrats to you and you bride! SQUAWK! @AMslimfordy many many Congratulations to you both! May your lives be filled with love and laughter! Put in the love, good looks and sweet temper into a well furnished house. Beat the butter of youth to a cream, and mix well together with the blindness of faults. Stir the pounded wit and good humour into the sweet argument, then add the rippling laughter and common sense. Work the whole together until everything is well mixed, and bake gently for ever. Slim, congrats to you both! May your lives be filled with lots of adventure, travel, sharing and just plain fun. @AMslimfordy Best news of the day! Congratulations to the two love-birds! Love the poster from Rovio! @AMSlimfordy -- I keep wanting to post congrats on your twitter page, but there is no mention there, although it has been tweeted both by BirdLeader and AngryBirds. Is it OK to send you a congrats tweet? Yes, that's fine @mvnla2. I appreciate it. I've gotten a few mentions there; I'm just keeping it low-key. Congratulations @AMslimfordy and the new Mrs!